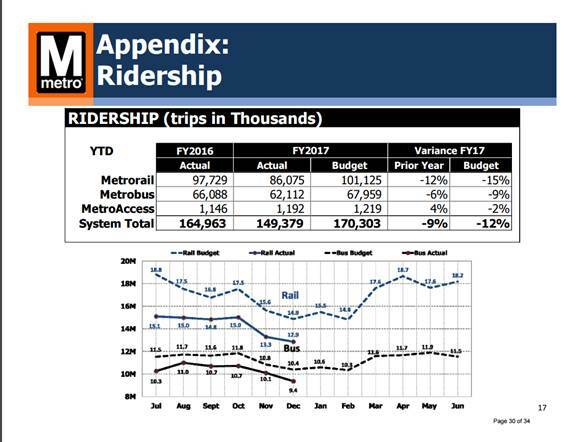 The drop in ridership over the first half of the current budget year is far steeper than previous declines. General Manager Paul Wiedefeld says that fiscal year 2019 could be a make-or-break year for the agency. 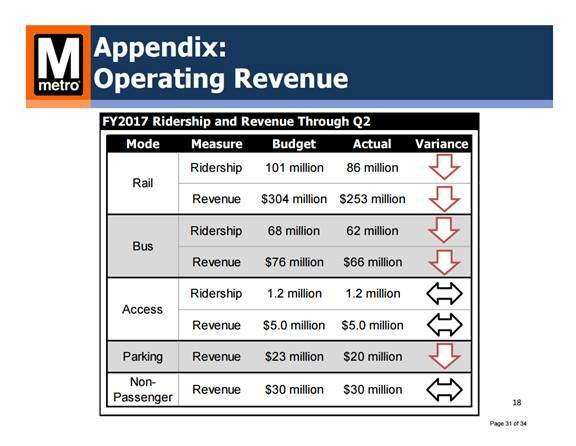 WASHINGTON — Far fewer people are riding Metro over the first half of Metro’s budget year, a drop that is much steeper than the last several years of rider decreases and is contributing to a projected $125 million revenue shortfall for Metro by the budget year’s end in June. Combined rail and bus ridership is down nine percent over the same time period one year ago, a drop of 16 million trips; rail ridership is down 12 percent. Compared with the peak in 2009, rail ridership is down by well over 100,000 trips each weekday. Metro had forecast a ridership increase in its budget despite a trend of years of declines, so the financial impact is even more significant, with projections now calling for $921 million in net subsidies from Maryland, Virginia and D.C. compared with the $845 million agreed to under the budget approved last March. General Manager Paul Wiedefeld told reporters Tuesday that the additional money would come from sources including past years’ surpluses. “Ridership was down broadly across all time periods, days of the week, and individual stations. Consequently, rail revenue was down 14 percent versus prior year and was 17 percent under budget through the second quarter. Parking revenue remained 11 percent below prior year and was below budget by 13 percent,” documents prepared for the Metro Board’s Finance Committee read. Metro estimates the direct revenue loss from 24/7 track work, which started last spring, at around $50 million; initial expectations were $40 million. Wiedefeld emphasized that the projects that can help avoid some serious safety incidents must continue. Revenues are $65 million below budget expectations so far. Metro says it has cut $59 million from the operating budget in the first six months of the budget year: Power and fuel costs are lower than expected due to lower rates and a reduction in trains thanks to the 24/7 work zones, and there have been some other back office savings. Regional leaders expect some more cost-cutting measures; increased local contributions can cover the costs for this year and next year, along with some agreement on significant service cuts and fare hikes proposed for the year starting July 1 to get the agency into 2018. The projected significant increases after that in requests for operating money and the capital projects needed to keep Metro running has much of the region is concerned that fiscal year 2019 (starting in July 2018) could be a different story — pitting money for Metro against other high priorities such as schools or police. Wiedefeld would not specifically say that, but suggested fiscal year 2019 could be a make-or-break year for Metro. “We cannot be eliminating 1,000 jobs a year — that’s just not a solution. But what I’m trying to do is maximize everything we can in terms of efficiency … but at some point there’s nothing left for me to go to, and we’re fast approaching that,” Wiedefeld said. Bus ridership declined by six percent year-over-year in the six months from July to December, a drop of four million trips. “Consequently, bus revenue was down 11 percent versus prior year and was 14 percent below budget for the quarter. Ridership at other local bus operators in the region has also declined during this period, indicating broader economywide causes that are not unique to Metro,” the documents say. Some bright spots for the bus system include growing ridership on the relatively new Metroway bus rapid transit system in Arlington and Alexandria that an initial proposal for the coming year had suggested cutting, and growth on the bus routes to and from National Harbor. But in December, for the first time since 2010, average weekday bus ridership fell below 370,000. A budget presentation suggests Metro could consider furloughing some workers, but Wiedefeld said that would be difficult since furloughs would likely impact service. More budget cuts could be suggested in coming months. “That’s what we’re left with, we have either service reductions we have to take or we have to figure out some other ways to come up with some dollars to support it,” Wiedefeld said. Metro is spending more than ever on capital projects meant to keep the system from deteriorating further, although much of the accelerated spending is tied to manufacturer Kawasaki catching up on delivery of the new 7000 Series trains after years of delays. Metro says it spent $599 million in capital funds from July to December 2016, and expects to spend more than the budgeted $1.1 billion by the fiscal year’s end in June. Much of the increase is due to the 7000 Series trains arriving at around 20 cars per month now after years of delays. Metro says it spent $84.1 million on track work in the first half of the budget year, including the 24/7 track work. The Metro Board would have to approve any increase in capital budget spending this spring. The board is also expected to approve the operating budget for the year beginning July 1 that would include service cuts and fare hikes. 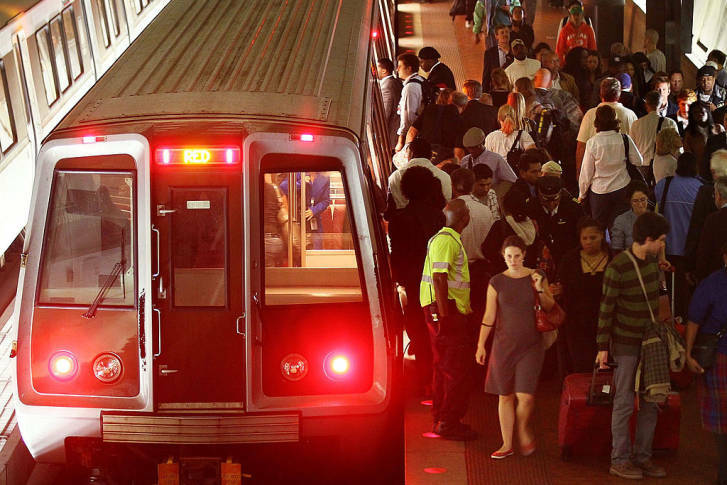 Metro hopes a review in April of the Metropolitan Washington Council of Government’s Transportation Planning Board’s role in Metro’s financial needs could be another step toward some type of more stable regional funding plan.